On Monday, employees of “The Barn & Cabin Friend” could be seen behind Morrow Funeral Home in Jeffersonville removing an old barn. The barn is owned by Dale and Penny Palmer — of Jeffersonville — who said Dale’s father played in the barn when he was a kid over 80 years ago. The couple said they believe it was built before the turn of the 20th century, making it well over 100 years old. A representative of The Barn & Cabin Friend on-site said the structure is not being demolished, but rather the wood will be moved to another location to be repaired before they rebuild the barn. 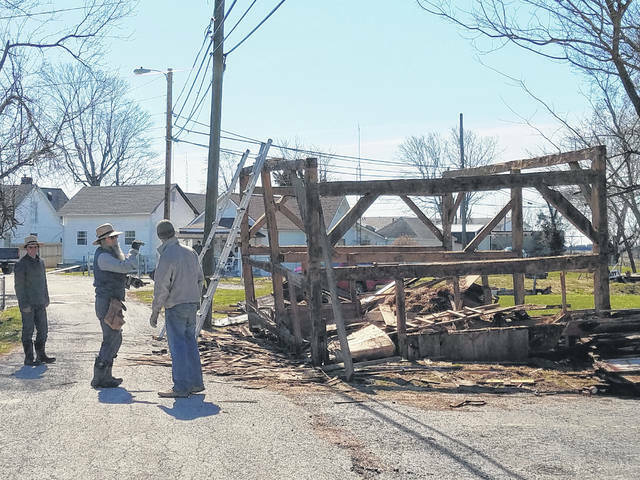 https://www.recordherald.com/wp-content/uploads/sites/27/2019/04/web1_20190401_114534.jpgOn Monday, employees of “The Barn & Cabin Friend” could be seen behind Morrow Funeral Home in Jeffersonville removing an old barn. The barn is owned by Dale and Penny Palmer — of Jeffersonville — who said Dale’s father played in the barn when he was a kid over 80 years ago. The couple said they believe it was built before the turn of the 20th century, making it well over 100 years old. A representative of The Barn & Cabin Friend on-site said the structure is not being demolished, but rather the wood will be moved to another location to be repaired before they rebuild the barn.